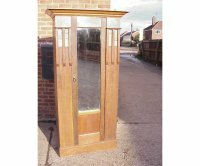 A rare oak Arts and Crafts linen press by Liberty and Co, the shaped cornice with two carved fleur de lys details and cupboard below with stunning hand wrought iron hinges and cotswold latch with three large drawers below with conforming hand wrought iron handles. Height 74", Width of cornice 44", Depth of cornice 25". Circa 1895. A good Arts and Crafts oak treble wardrobe in the Glasgow Style attributed to Shapland and Petter, with half moon hat flanked by dentil moulded cornice, a central panel with wonderful stylised floral fruitwood and Pewter inlays, flanked by a pair of bevelled mirrors to the doors with stylised copper strap hinges opening to reveal full hanging space inside and a pair of large drawers to the base. Height 90 1/4", Width of cornice 76 1/2", Depth of cornice 23". Circa 1900. 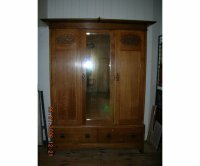 An Arts and Crafts oak treble wardrobe in the Glasgow Style made by Harris Lebus and retailed by Liberty and Co, with flaring cornice, a full length mirror flanked by two doors with wonderful green glass squares to the top and A frame central panels and two drawers below on square platform feet and the best quality copper handles. Height ", Width of cornice ", Depth of Cornice". Circa 1900. 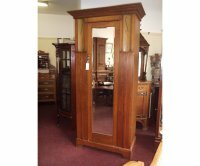 Liberty and Co Oak Arts and crafts three peice bedroom suite, with wonderful stylised floralcarved details to wardrobe and dressing table, shaped bevelled mirrors and exqusite tiles to washstand back. Stamped LandCo on all the handle drops. Wardrobe Height 81 1/2", Cornice Width 54 1/2", Cornice Depth 21". Dressing Table Height 68 1/2", Width 42", Depth 19 1/2". Washstand Height 49 1/2", Width 42", Depth 18 1/2". Circa 1895. 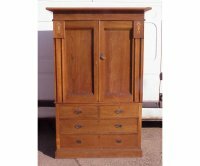 An Arts and Crafts oak bedroom suite made by Maple and Co with copper strap hinges which curl at the ends. The dressing table with squashed heart details to the mirror uprights, the washstand with black marble and conforming squashed heart details. Wardrobe Height 78 1/2", Depth of cornice 22 3/4", Width of cornice 41 1/2". Dressing table Height 55", Depth 20 1/4", Width 36". Washstand Height 41", Depth 20 1/2", Width 36". Bed Width 3'. Headboard Height 49". Circa 1900. 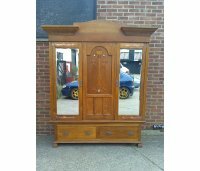 An Arts and Crafts oak double wardrobe and dressing table in the Glasgow Style with a copper panel to top depicting a Galleon at sea, with two doors and double hanging space with a pair of drawers to the base with square pierced copper handles. The dressing table with stylised floral fretted details to the uprights. The images do not do this setjustice the true colour can be seen in the very last two images. 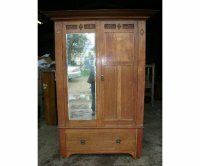 Wardrobe height 85", width to cornice 58", depth 19", Dressing Table width 42", depth 21". Circa 1900. 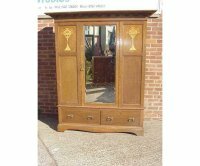 An Arts and Crafts oak wardrobe, the daffodil design inlays on concave panels to the upper sides are after a design by M H Ballie Scott with flaring cornice and a full length bevelled mirror to the door. 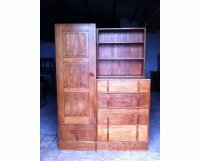 Four x single oak wardrobe/hall cupboards made by Heals and Son. Circa 1930's. I also have a double version of this in stock. Approx measurements :- Height 6', Width 24", Depth 28". 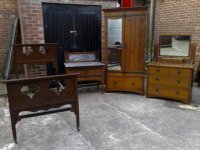 A three piece bedroom suite attributed to Liberty and Co, with stylised floral and string inlays throughout. 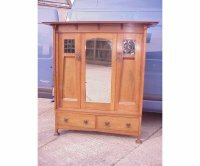 A good quality two piece oak Arts and Crafts bedroom suite with stylised floral carving to the top and stylised floral inlays to the right hand door. Wardrobe Height 84 1/4", Depth of cornice 25", Width of cornice 60". Dressing table Height 67", Depth 21", Width 45 1/4". Circa 1900. 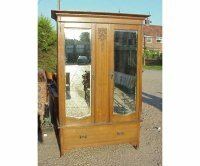 A Glasgow style Arts and Crafts oak single wardrobe by with flaring cornice, stylised green flowing into white coloured glass (one panel cracked). Height 7', Depth of cornice 20", Width of cornice 40 1/2". Circa 1900. 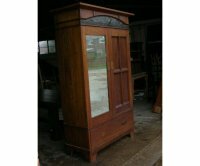 An Oak Arts and Crafts linen press with pewter and ebony inlays. Width of cornice 54", Depth of cornice 23", Height 83". Circa 1900. 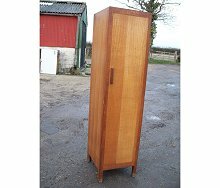 A Glasgow School oak treble wardrobe designed by EA Taylor and made by Wylie and Lochhead. 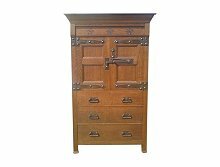 A Cotswold oak compactum, from Loughborough College, the furniture made for Loughborough College was overseen by Edward Barnsley.